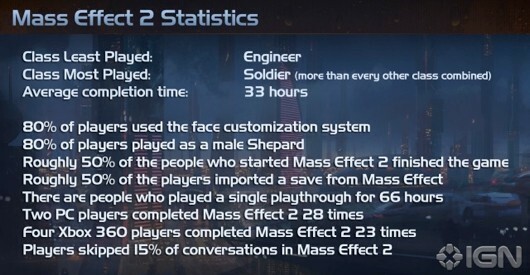 In an interview with IGN, BioWare revealed some of the stats they’ve collected about people’s Mass Effect 2 habits. Interestingly, half of the players imported their game from the first Mass Effect and only half of the players actually finished Mass Effect 2. Much more interestingly is the revelation that four Xbox players completed the game 23 times. Considering they also say that the average time to complete a game of Mass Effect 2 is 33 hours, that means these four people spent roughly 32 solid days of their life playing this game. That’s almost five weeks. Solid.